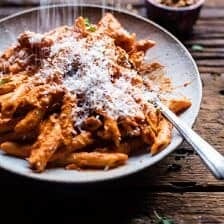 Crockpot Sun-Dried Tomato Penne Alla Vodka. So many good things to share on this snowy Wednesday! 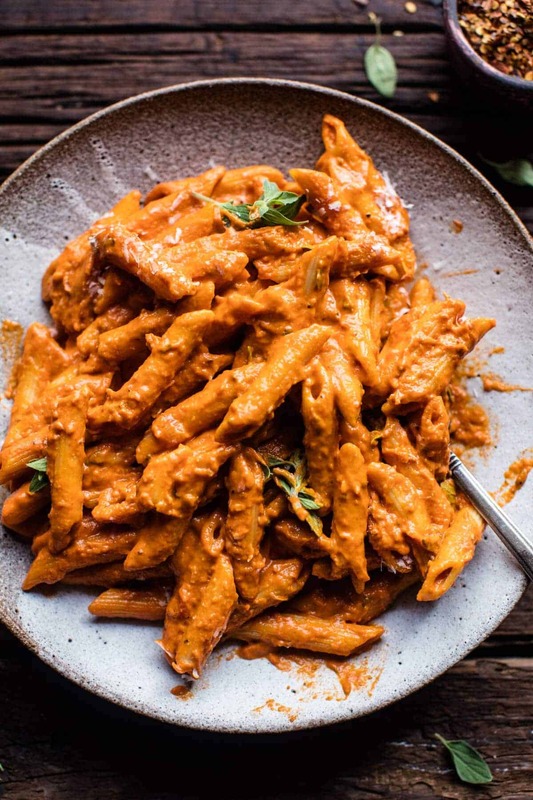 Thing one, this luscious Penne Alla Vodka. It’s creamy, cheesy, a little boozy flavored (but not alcoholy cause all of the vodka cooks out), SUPER EASY and DELICIOUS. The sauce is made in the crockpot, so it’s kind of perfect for those nights when all you can muster up the energy to do is boil some pasta and call it a day…aka TODAY. I’m feeling like since it’s December, and we’re all still getting used to the cold, that nothing seems more perfect or cozier than a giant bowl of pasta, sauce and cheese. Just add some crusty bread, maybe a warm fire and call it a day…literally. I’m saying all this because it’s currently snowing like crazy out (lovin’ it) and I am currently huddled by my heater, staying all toasty warm but wishing I had a bowl of this pasta in front of me. <-truth. Anybody in the same boat or what? I hear you midwest people got some snow…are you loving it or hating it? For me, the entire month of December should be filled with snowy days and nights. It’s just one more excuse to eat pasta, watch Christmas movies, and drink hot chocolate. Obviously. Thing two, Monday night was spent watching my little sister, Asher perform in the town play of Harry Potter and the Cursed Child <–seriously. Not sure how my little ski town decided to put on a Harry Potter play, but they did, and it was awesome…or I mean, fun…or I mean, entertaining. Let’s just say it was hard to keep a straight face throughout the performance. None of the kids were older than ten or eleven, so as you can imagine, it’s was a little all over the place. Asher didn’t have many lines, but for one of them, she was standing in the wrong spot on stage (in the dark). The teacher literally picked her up and moved her into the spotlight all while she continued speaking…freaking hilarious. I almost wasn’t going to go because I’m slightly swamped with end of the year work, but when Asher called to ask me to come, I just could not say no. Glad I went too, because it was so fun to see Asher in the play. I’m clearly biased, but she was the best…and the cutest! Plus, I finally got to see my younger brother, Red who’s been traveling for over a month. It was a short catch up, but I mean, at least I got to say hey to the kid, right? This would have been the perfect dinner to have waiting for everyone at home, but the fam all decided they wanted to go out. I unfortunately had to get home to finish some things up, so I got to drive home solo in the snow storm. Luckily I’m used to the snow and have good tires. In all honesty, I have seen worse weather around here (I just don’t usually have to drive in it! ), but I really enjoyed seeing all the Christmas lights in Breckenridge that seemed to highlight the falling snow. <–major dork alert. 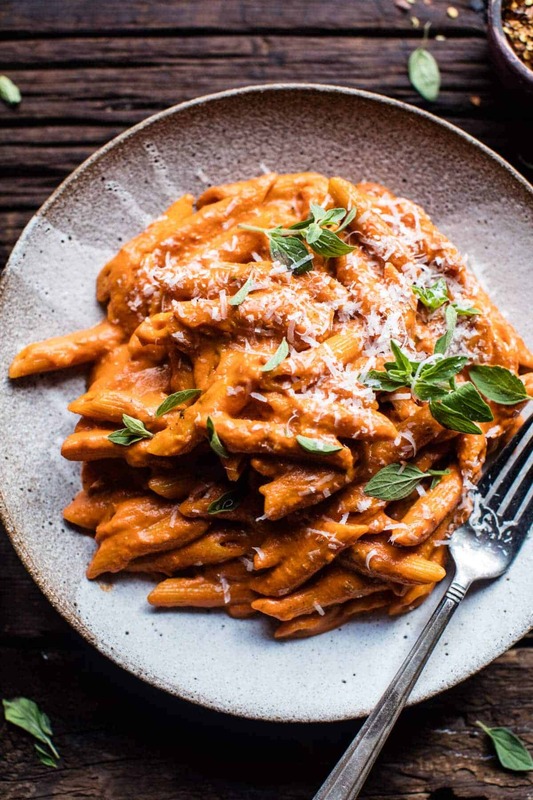 Anyway, this penne alla vodka has been my go-to dish to make on Sunday nights and then serve the leftovers throughout the week. This dish makes a lot of sauce so it’s great the first night served over pasta, but then you could totally get creative with the leftovers. 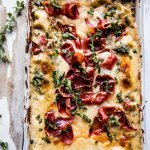 I’m talking pizza, pasta bakes, served with eggs, the options are kind of endless! If you’re serving this to kids, don’t worry about the alcohol, it all gets burned off during cooking (first you boil the sauce, and then you cook it for a min of 4 hours!). All that you’re left with is a deliciously flavored tomato sauce. A must do with this dish though? Top it with lots and lots of freshly grated parmesan and serve it with crusty bread for scooping up extra sauce. Heat the olive oil, onion, garlic, crushed red pepper, and dried oregano in a large skillet over medium low heat. Cook, stirring often until the onion is soft and the garlic fragrant, about 10 minutes. Add the vodka, raise the heat, and bring the mixture to a boil, boil 5 minutes. Remove from the heat and add to the bowl of your crockpot along with the tomatoes, sun-dried tomatoes and large pinch of salt + pepper. Cover and cook on low for 6-8 hours or on high for 4-5 hours. Transfer the sauce to a blender and puree until smooth. Return to the crockpot and stir in the the cream and the parmesan. Cook uncovered on high for 10 minutes. Meanwhile, bring a large pot of salted water to a boil and boil the pasta until al dente according to package directions. Drain. Divide the pasta among plates and top with the sauce, fresh oregano and grated parmesan. Eat! *You can use the oil from the sun-dried tomato jar in place of the 1/4 cup olive oil. ps. since you already have the vodka out, may I recommend these festive Pomegranate Moscow Mules?! Happy Wednesday! 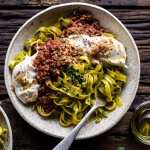 This is my kind of recipe–love the pasta. Thanks Nancy!! Knew you’d like this one! This looks so creamy and delicious. Sun dried tomatoes are one of my favourite ingredients! 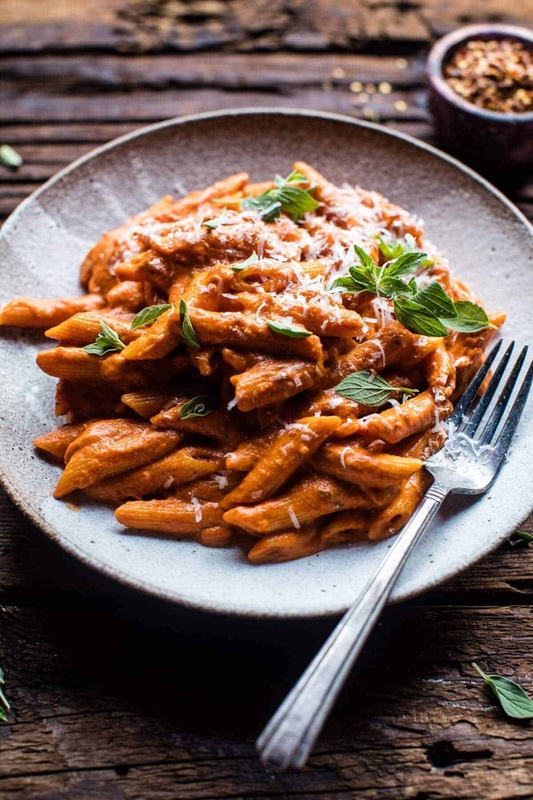 Hm hm, I could so easily eat a huge bowl of this and NOT feel guilty… I love pasta, I love tomato, I used to love vodka, so I guess I would love this dish very very much!! Awh! Such a bummer!! Maybe you can make it again when it snows!! Vodka Sauce is my favorite! 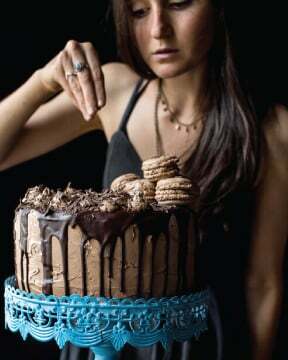 I will make this recipe this weekend for sure! Thank you and Happy Hump Day! This sounds delicious and I am loving my crock pot lately (making your butter chicken recipe but subbing in tofu) on repeat. 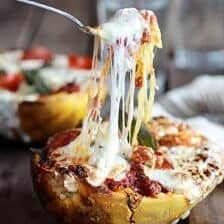 Could I halve this recipe and still use slow cooker? Thank you! Hey Lori! Yes, you can totally halve this. You can cook the same time or slightly shorter. Let me know if you have questions. Today, it is raining. Tomorrow? Who knows. I may have to brush the snow off my car, again, soon. I would love a full plate of warm pasta. That would create an evening smile as I turn on the heat before I sit down. Ah, right! The weather is so unpredictable!! I hope you get to try it Jude!! I am so glad it turned out great and you loved this recipe Jude!! Thank you so much! I just love you’re blog and you’re recipes. Thank you so much! Love love LOVE! Pasta is always a winner in my book! 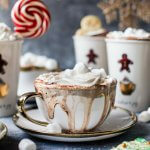 And this looks perfect for our cold rainy days we have been having here in Virginia! Thank you so much!! Cold rainy! Ah, i hope it turns to snow sooon! Hey Tieghan! This recipe couldn’t be more timely! I was planning on trying my hand at home made vodka (a local store makes their own and it’s pretty hard to beat) and this is the recipe I’m going to make! Can’t wait to try it! Perfect!! Hopefully its close to as good as theirs!! Thank you! Hi Tieghan! I couldn’t reply to my original post so submitting a new one. Just wanted to say I made this last night, didn’t change a thing, and it was delicious! So glad I have a good vodka sauce in my rotation now! Thanks again! whoops, I guess it worked! Awh thanks so much Kathy! The rain is such a bummer!! I wish I could!! Great timing! 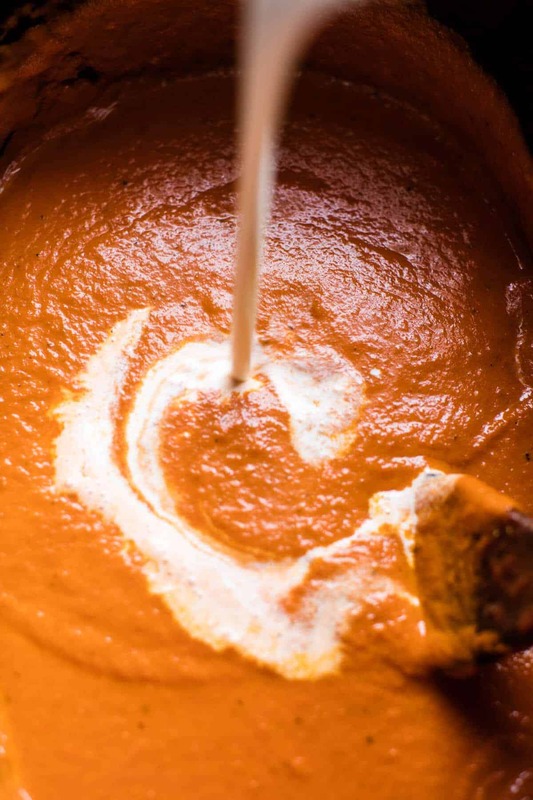 I’ve been looking for a vodka sauce recipe for a get-together I’m hosting this weekend. This is perfect! Ah so perfect! Hope you love it Meagan! Thanks! Yummy this looks like perfect comfort food, I love that you can cook it in the crockpot! Thanks Rachael! I love making crockpot recipes!! Perfect dish for a snowy day Tieghan! So cozy and comforting. My favorite kind of food. Send some of that snow my way! This looks like the perfect warm and comforting pasta dish! Yes!! I hope yoou love it!! Thanks!! No snow in sight here yet but I hope we will get some. Last year we did not and I was sad! 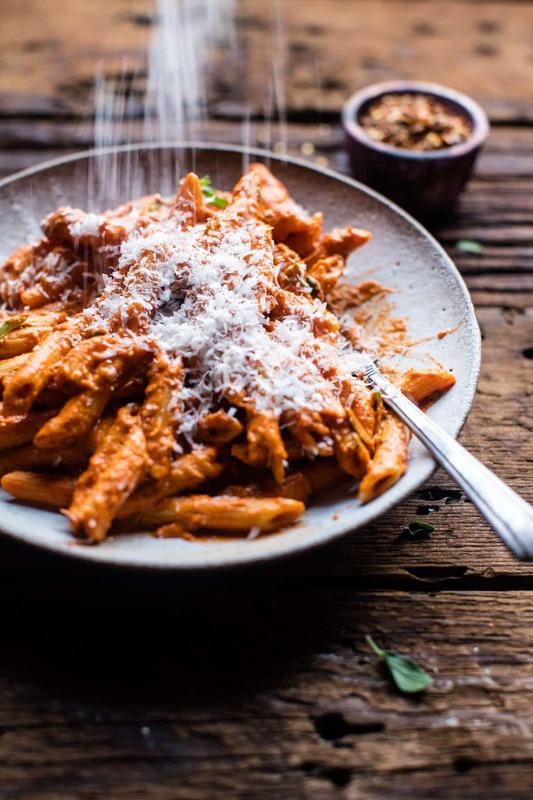 Such a cozy dish to eat and yes : winter is all about pasta, sauce and cheesy goodness. Thanks Tieghan! Ah!! I hope you get some! Then you can make this and enjoy!! Wow, yum! 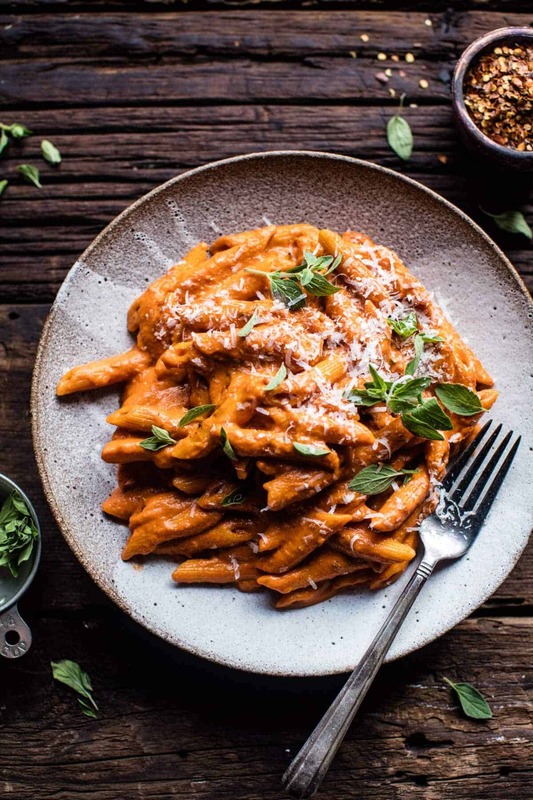 I bet I could have this pasta on the menu every single day and never get tired of it! Could you still make this if you didn’t have a crockpot? If so, how would you recommend doing so? Yes! Just simmer on the stove over low or in a 250 degree oven for 3-4 hours. Should work great! I’m happy to put the cookies aside right now for a heaping bowl of this deliciousness! Exactly!! I always will put the cookies aside for this one!! Right! The perfect hump-day meal!! YUMMM!!! Sun-dried tomatoes are my jam! This looks amazing! We are supposed to get some snow here tomorrow, fingers crossed!! This is perfect for a snowy day! YES!! That would be so perfect!! Ok, made the full amount for dinner and my family said it was the best pasta sauce they have ever had in their lives. And, best of all, there’s half left over. Thanks for a great recipe. WOW!! Thats amazing!! Thank you so much for making it!! This looks so delicious and simple, it’s going on our meal plan for next week to combat the extra cold weather we’ve been getting lately. Yay! I hope you love it Sarah!! oh my GAWD, this looks freaking amazing!!! I’m going to try this! Maybe this weekend! love! Has anyone tried making this substituting a non-dairy option for the heavy cream? BF is dairy free and I’d like to make it for the both of us. This looks so AMAZING I can almost taste it right now! Hey Elaine! I have not tried it but I think that canned full fat coconut milk would work awesome! Let me know if you have questions. Thanks! It’s just finally getting cold here, but no real snow yet. 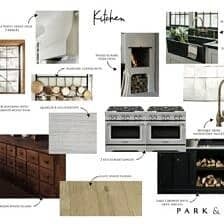 This looks like a great dinner for the weekend since I’ll be using the oven all day for cookie baking! Ah thats perfect!! Yay for getting cold!! Hope you love it Kim!! Hello! We’ve been following your blog and you make the BEST recipes! We’re living in Russia right now and don’t have access to a crock pot. Do you have any suggestions for cooking this on the stove? Thank you in advance! Hey Lauren! Thank you so much, so happy you enjoy my recipes! To cook this one the stove, J=just simmer on the stove over low for 3 or so hours or in a 250 degree oven for 3-4 hours. Should work great! Let me know if you have questions. Thanks! I made this a few days ago and it’s amazing. By the way, I made a pound of pasta and still had a ton of sauce left. I made another pound of pasta yesterday and used up all the sauce. Pretty awesome as leftovers for lunches. Thank you! So happy you liked it and were able to make to meals of it!! Thanks so much KP! I made this tonight and let me tell you, it was DELICIOUS!! 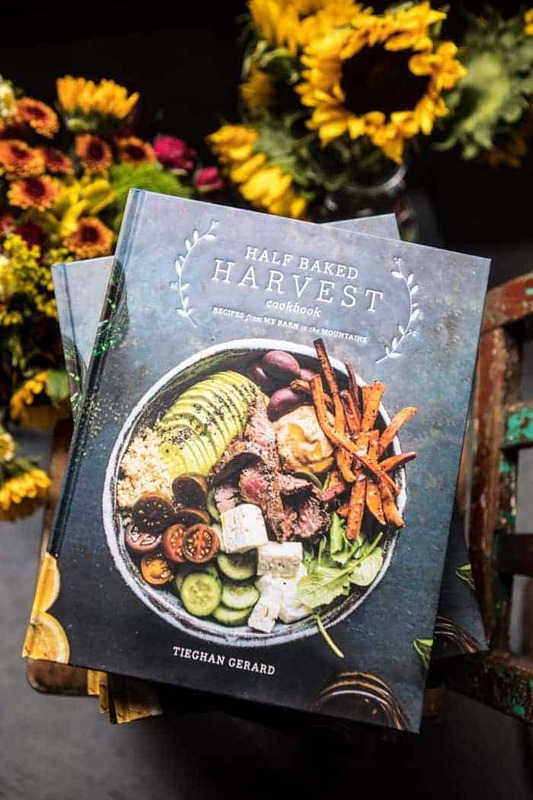 Thanks Tieghan for another amazing recipe! ? This was my dinner tonight to test run for Christmas dinner when we have (as we always do) vegetarian and omnivore diners. This was delicious and will be on the menu for sure. The bonus is that it is made in the slow cooker so I have an extra burner on the stove and I can put it together well ahead of time. I wonder if it would freeze well. Thanks for a great recipe! Hi! So happy you loved this! The sauce freezes great! Just add the pasta to the hot sauce once it is thawed. Let me know if you have questions! Thanks again! Made this last night. It was subtly delicious. The recipe does make a very large amount of sauce so tonight we are going to use the leftovers and add pan seared shrimp. Keep the great recipes coming. So happy you liked it Mark! It does make a lot but who doesn’t love leftovers! Thanks!! I made this a few nights ago and it was DELICIOUS! I served it with some grilled turkey sausages on the side for my husband. I froze the leftover sauce to enjoy next week! Thank you for a great recipe! Hi Kristen!! I’m so happy you liked it!! Sounds super yummy!! Thanks so much!! Just finished making this dish to take to a “booze” themed potluck – THE best sauce EVER! The hardest part was smelling the sauce cooking all day! This will be the only tomato sauce I make from now on. Thank you for this great recipe! Hi April, thank you so so much!! So happy you like it! We made this the other night and it was amazzzzzzing! There’s only two of us so next time we’lol probably make a half recipe though. Can this be frozen & reheated without losing any quality in the sauce? Or, roughly how long can we keep it in the fridge? I plan on eating this for a couple of weeks. 😀 Oh and any suggestions for other uses with it? Hi Lauren! The sauce freezes great, just don’t freeze it with the pasta. I would say that the sauce will last a week in the fridge. As for other uses I use this sauce for pizza, dipping bread, a base for soups or served with grilled cheese. Let me know if you have other questions. Hope you and your family had a Merry Christmas! Halved the recipe and it was plenty for three. Terrific! I’m a huge fan of yours. All my reviews are raves. Hope you don’t mind. Wow! SO nice of you! Thanks so much David! Just made this….so amazing! I love finding other things to put in my crockpot! I am so glad you loved it! Thank you Julie! This looks so delicious! Is it possible to skip the blending step? Or is it super crucial? I made this shortly after you posted it on Instagram and it was DELICIOUS. I added shrimp, too. Thank you! Sounds delish! So happy you liked it Natalie! Thank you! 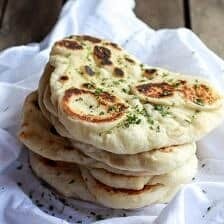 Question about the recipe. It says 2 ounce cans whole tomatoes. Is that all we need is 2 ounces of tomatoes? I bookmarked this recipe a while ago and have been meaning to try it since summer but its the kind of recipe you save for a cold day you need to liven up with warm creamy goodness! I woke up early to sautee the onion and garlic and just threw it in the crockpot and forgot about it until my boyfriend texted me while on his lunch break that he had stopped home to grab a few things for work, tried the sauce and…. drumroll… “best sauce ever, hands down”. So excited to go home and try this! *side note* there is a recipe for vodka sauce that has been circulating since the 90’s amongst single women in NY that is supposed to guarantee you to get laid, This might be the real, true recipe! Haha oh wow! I am so happy you and your boyfriend loved this! Thank you so much! 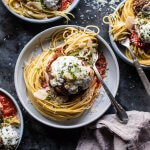 Can the sauce recipe be used for spaghetti ie spaghetti & meatballs ? Thanks. I am so glad they did! Thank you Jeff! The Sun-dried tomatoes says ‘see note’ but there is no note? The first time I made this I looked at my hubby and said, “I’ll never buy another jar of vodka sauce again!” It’s AMAZING. I’m planning to make a double recipe and freeze it. Would you recommend not adding the cheese and cream before freezing? Seems like it could separate when reheating? Thanks! No crockpot here, but I’ve got a gorgeous LeCreuset pot. How long and at what temp do you think I can bake in the oven? Looks delicious. Just found your blog and I’m already crying inside bc it’s so pretty!!! One year later and I am making this recipe, again. I had to let you know that if I eliminate one ingredient and substitute that for this or that, it is still, overall, a yummy recipet. I am so happy to hear that Judes! Thank you so much! More than one year later, I am making this again, a couple of substitutions. Always lovely and yummy. We are a dairy free family, I usually sub heavy cream with coconut milk/cream. Do you think it would work in the crockpot recipe? Any recommendations on how to do this in the instant pot? I made this lovely recipe this evening and it was a HUGE hit amongst the kids and the adults. I am so happy I stumbled upon this recipe and plan to make it again and again and again! I do not have a slow cooker so I slow cooked it in the oven as suggested in one of the comments, worked out perfectly! So I am in the middle of making this and not done, but I have a comment on the blender part. I didn’t want to skip it because I don’t like chunky sauce. So, I had enough common sense to not fill the blender up all the way–due to the heat/steam/pressure. However, I still had a difficult time–and a mess. Maybe I am a novice “cook”—-compared to the others that have commented—but please insert how to carefully blend hot stuff in a blender. BTW, it smells wonderful–and I can wait to eat this! If making this on the stove do I follow the same order of directions with the ingredients as the slow cooker? Or throw everything in a pot at once? Thanks I’m excited! 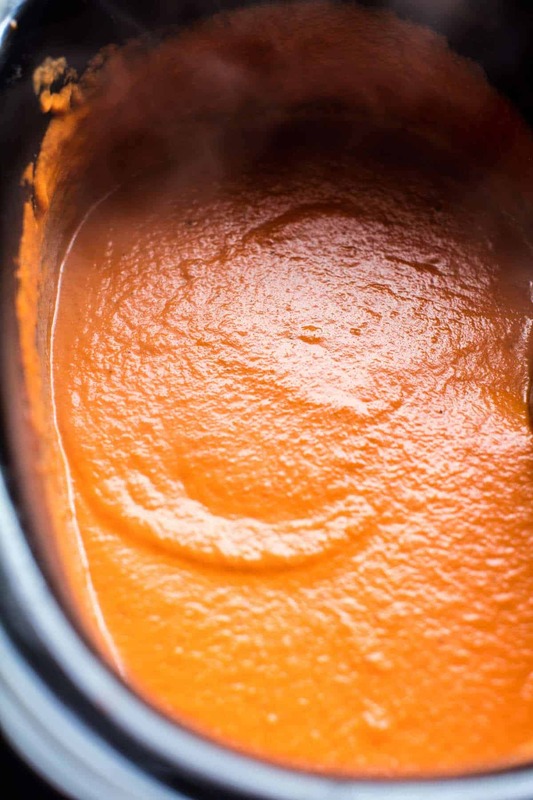 Have you tried cooking the pasta in the crock pot with the sauce? Or, can cooked pasta be added back into the sauce, mixed and served? I know the latter seems obvious, but until Ive tried a recipe I like to ask. 🙂 Thank you – and especially for the always great recipes and stories! 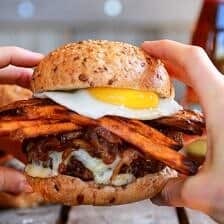 Hi, I know this recipe was posted a few years ago, but I wanted to thank you for sharing it. I’ve made it countless times (as written) and it’s one of my favorite recipes ever. I’ve encouraged many friends and family members to make it; it’s so good.